The animation shows what the eclipse approximately looks like in Chevak. Stages and times of the eclipse are outlined below. All times are local time (AKST) for Chevak. During this penumbral lunar eclipse, the Earth's main shadow does not cover the Moon. 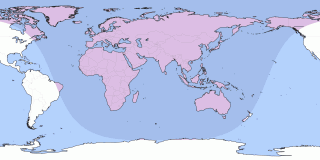 As the Earth's shadow (umbra) misses the Moon during a penumbral lunar eclipse, there are no other locations on Earth where the Moon appears partially or totally eclipsed during this event. A penumbral lunar eclipse can be a bit hard to see as the shadowed part is only a little bit fainter than the rest of the Moon. Note: Click on the date link for details in Chevak, or the path map image for global details. Currently shown eclipse is highlighted.